David Drieling is a living example that you can accomplish anything if you are determined. God has blessed David to overcome in many areas of his life. It was five years ago that God began the most important change when he was saved David from a destructive life of sin. Before he gave his life to Jesus David lived a reckless life filled with drugs, alcohol, and wild partying. But that all changed for David when he moved Atlanta after being in a terrible car accident. During this wreck, he was thrown 75 feet and suffered severe brain trauma. He had to relearn how to walk, speak appropriately, and relearn how to do normal things we take for granted. The accident also caused his left arm to stay in an L shape, and his hand stayed in a tight fist locked to his chest. Because of his injuries he was unable to button his pants, tie his shoes, or drive. Despite his limitations, he prayed and believed God would heal him. God began healing David’s body, and David gave up the wild parties and drugs began a healthy lifestyle of eating right, exercise, and spent hours every day in the gym to rehabilitate his body. God was doing great things in his spiritual life and David was taking better care of his body but he was also determined to further his education. 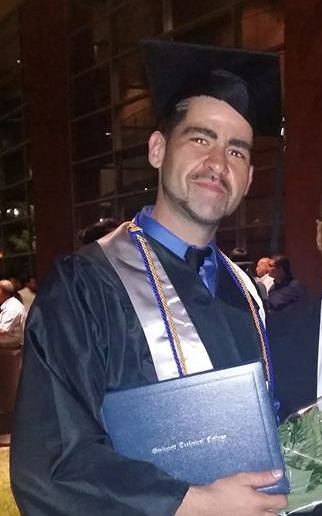 At age 20, David dropped out of high school with a 1.7 GPA. Although the doctors told him he had brain damage from the car accident, and he hadn’t been in school for some time, David did not let that stop him. He took the GED, enrolled in college, and graduated from college with an associate degree in Applied Science with a 3.7 GPA.